West End House has seven letting rooms, one double, one twin, two family rooms and three single rooms. 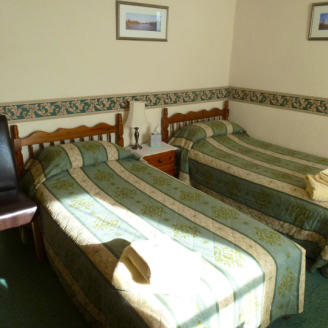 All rooms with the exception of the singles have En-Suite facilities. All rooms have a flat screen colour television and there is a resident’s lounge where tea, coffee, hot chocolate and biscuits are available. Free wireless Internet is available for our guests. The dining room is a lovely sunny room where you will be served with a full Scottish breakfast including Haggis! Something to set you up for a day exploring the area. There is a lovely enclosed garden at the rear of the property with a nice seating area and BBQ facilities, which guests are more than welcome to use. There is also off street parking available.